You were born in the water, into your father’s hands, looking at him before you took your first breath. You were calm and content, hardly cried and were alert right from the beginning. Placed upon your mother’s chest, the three of us still in the water, you looked up and registered our faces. We were in the care of midwives at the birth centre in Sherbrooke. When we arrived, we settled into our large private room. They brought us fresh fruit and dates and we played our own soundtrack while I took a warm bath. 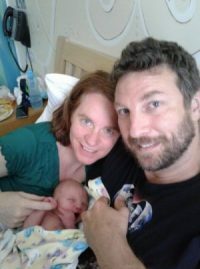 I asked the midwife if I should be moving, but she reassured me this was not a race, that I should do whatever felt right, and she would be there to help anytime. Reassured, I laid back and submerged my moon belly. Sometimes I used a birthing ball, a birthing seat, the bed, or material hung from the ceiling on which I could pull myself up. It was a dance with the force of life, pushing its way into this world. After you were born, the three of us slept in the double bed, tired but full of wonder and excitement. The team took superb care of us, providing meals, helping us with your first diapers, and assisting us with the car seat for your journey home the next evening. We had chosen to have a midwife because we appreciate the approach of these women who trained for over 4 years to be specialists in pregnancy and natural birth. Medical intervention is a wonderful thing when required, but is often applied before necessary. As one nurse told us: one intervention is inevitably followed by more. Since I am in my early 40s, I am considered high risk in every possible category. We weren’t comfortable giving birth at home, so the birth centre was the perfect solution. This is not to say the midwives are less vigilant than doctors or nurses. All of our regular checkups with Annie and Sonya lasted over an hour, tracking my health and yours, and answering all our questions. We built a special relationship with them, including your father in the entire process. Two days before you were born, during a planned visit with Annie, she expressed concern because the uterus was smaller than it should have been. At nearly 40 weeks, this could mean you had descended into the pelvis, ready to be born, or it could mean there had been a growth stagnation and a problem with the placenta. Sent off for an immediate echograph, I was faced with the alarmist approach of a doctor handling a “geriatric” pregnant woman. She disapproved of some of the fully informed decisions we had made throughout the pregnancy, spoke about risk of a deficient placenta due to my age, and listed ways you could die in utero! She proposed a stripping to encourage waters to break, and suggested inducing the birth, or even a caesarian, for no other reason than my age. All of this stoked an unnecessary fear in me. It turned out that you were simply a small baby. But she did still recommend inducing the birth. I thanked her, left with the paperwork, and called Annie who reassured us that the echo showed you were perfectly healthy. The next morning, contractions began and you were born according to your own rhythm, with no intervention. Sonya and then Annie came to visit us at home many times. They did all the checkups and answered our endless questions. Until you were 6 weeks old we had weekly appointments. It was a sad farewell, having shared a 10-month journey. We are convinced your calm nature is in part due to such a birth, which was possible because of our experience with the midwives: autonomy, respect, support, intimacy, reassurance. A birth environment is an important choice, and each expecting parent has preferences. If you have a brother or sister in the future, we will happily return to the birth centre. 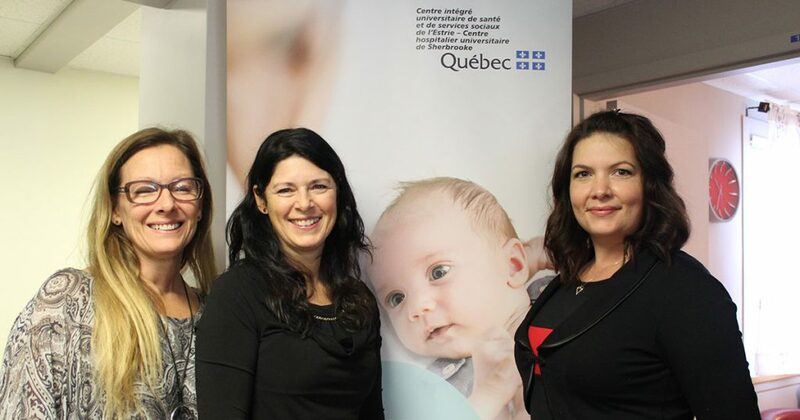 If you have questions about the service offered by midwives, or about the Maison de Naissance in Sherbrooke, you can call the Service Point in Granby 450 375‑8000 ext. 66319.